Mistakenly believing this to be one of those increasingly rare 'I can't believe Alex has never reviewed this!' bands, I was quite excited at first to hear Sivyi Yar (or Sivyj Yar depending on your translation from the original Russian name) before realising that I'd missed his review of the one-man-band's 2012 EP. Still, considering how good this is, there's no harm in stepping back a few months and giving From the Dead Villages' Darkness some more coverage. And what an album it is! Somewhere between the melodic black metal of Drudkh at their finest and the pagan approach of the likes of Winterfylleth, Sivyi Yar's sound is distinct through the slower, more melancholic pace and greater use of melody in their approach to black metal, which is almost progressive but not quite. This is pagan metal through and through – although there's the odd bit of violin and flute, mastermind Vladimir mainly focuses on the core metal instruments, utilising them so well that at times it hardly seems like black metal at all. Yet black metal it is, and the four tracks here (with intro and outro pieces at start and end) are the kind of lengthy, atmospheric journeys that the best of the genre can take you on. First track proper Now Only Abyss Hear Us opens like classic Drudkh, if with a better production and more focus on the rhythm section, building on melodic riffs and Vladimir's vocals, a harsh but not too harsh bellow that fits the music perfectly. A break for some sampled rain atop acoustic strums is an excellent interlude before the metal returns with an almost post-metal atmospheric vibe, using just enough violin to enhance the music even more. Yet, again, the music itself is good enough to not need it, as the following title track proves with a structure that again approaches post-metal whilst using all too blackened a set of tools, lead guitar practically dancing above the rhythm section and again pausing for a (brief) acoustic interlude. The riff interplay later in the track reminds me of Drudkh's ill-fated Handful of Stars, albeit stripped of the post-punk elements and a more successful experiment with progressive elements in the songwriting – terrific stuff, all told. What makes From The Dead Villages' Darkness so delightful is partly due to the songwriting, but is essentially due to the sound. 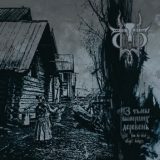 The likes of Distant Haze Was Arising are simply delightful, a fine reminder of what originally attracted us to the Drudkh sound when it was new and beautiful, moving skilfully between ambience and melodic metal while still keeping a grip on the essential darkness at its root that makes this black metal. With the Birds' Farewell Song continues this towards a more progressive, reflective tone, sounding as if it is being played on a xylophone at moments in a melodic aural waterfall that fans of Botanist will love. This is remarkably good, an album that will please the ears of us Eastern European black metal fans who have grown used to the current drought of ear candy, but a powerful reminder that Russia can produce some excellent black metal on occasion. Above all, this is definitely an album that you should be catching up on from 2014, a disappointing year for metal in many ways, but one not without its gems.